One of the most talked-about new plays in American theater comes to Syracuse when Syracuse Stage presents Lucas Hnath’s critically acclaimed “The Christians,” April 6-24, in the Archbold Theatre at the Syracuse Stage/SU Drama Complex, 820 E. Genesee St. Since its premiere at the Humana Festival of New American Plays at the famed Actors Theatre of Louisville, “The Christians” has been produced at numerous theaters, including Playwrights Horizons in New York. The New York Times called it one of the best plays of the season and called playwright Hnath one of the brightest new voices of his generation. Set in a large, contemporary, non-denominational Christian church, “The Christians” is performed with lively theatricality that emulates a Sunday service. 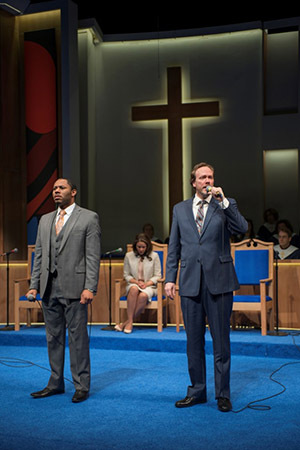 The actors use hand-held microphones throughout and much of the performance has the rhythm and feel of a sermon. A live choir, under the direction of composer Michael Keck, sings gospel songs. The choir at Syracuse Stage is made up of local members of the community. The substance of “The Christians” concerns the impact of a decision by the congregation’s popular pastor to announce a change of heart and mind concerning a matter of doctrine. The decision has unexpected and unintended consequences for the pastor, his family and the congregation. Throughout, Hnath steadfastly avoids taking sides. His concern is not to make a determination of right or wrong, but rather to explore the widening divide that makes communication and understanding increasingly difficult. “I have a powerful urge to communicate with you, but I feel there is an insurmountable distance between us,” the pastor, named Paul, says at one point. Producing artistic director Tim Bond directs the Syracuse Stage production. He believes that Hnath’s observations could be applied to any number of subjects that create rifts between people. Hnath has chosen religion as his subject to contextualize the action and to prompt an examination about “our deepest and, often, most noble desires and motivations and yearnings,” as a review in Christianity Today noted. This production marks Bond’s final directorial effort as Syracuse Stages producing artistic director. In July, he moves to the University of Washington in Seattle, where he joins the theater faculty as a full professor. In many ways, “The Christians” is a fitting capstone to his nine-year tenure. It is a play that encourages community and invites people of all faiths, believers and non-believers, to try to overcome the seemingly insurmountable divides evident in so many aspects of the contemporary world. Hnath grew up in a Christian household in Orlando, Fla. During his childhood, he expected to become a preacher. He attended college at New York University, where he studied pre-med before switching to dramatic writing. He went on to earn both a B.F.A. and an M.F.A. in dramatic writing from the university. Hnath now teaches as part of the dramatic writing faculty at the university. His previous works include “Isaac’s Eye,” “Death Tax” and “Red Speedo.” For “The Christians,” Hnath has received the Kesselring Prize and the Steinberg/ACTA New Play Award, among other awards. Tickets are available at syracusestage.org, and at the Box Office, 443-3275 (Monday-Friday, 10 a.m. to 6 p.m. and two hours before curtain).